Are you considering dental implants? If so, cost may be an important factor in your decision. When dealing with any dental issue you have a wide array of options and it is important to consider what is best for your dental and oral health as well as your wallet. Dental implants are embedded in your jaw and bond with your bone. The implant becomes a sturdy base for a crown that is designed to replace a lost tooth. Implants can be used to successfully replace lost teeth and prevent further damage. The short answer is between $1,500 to $10,000 per implant. But there is so much more to the story. A dental implant is used to replace the missing or damaged roots of a tooth. It takes several steps and materials to create a complete implant. Some dental offices may quote you a price for the entire implant, while others price each step individually. It is important that you know what is included in any quote you receive. Why Can Dental Implants Be Expensive? It is important to understand that a successful dental implant can last you a lifetime. It also requires a knowledgeable and experienced dental professional. In addition, the installation of the base of a dental implant is a surgical procedure. When you consider all of these things and then add the cost of the custom made materials such as a crown or denture, it becomes easier to understand the high price tag. What Affects the Price of Dental Implants? Your overall oral health can play an important part of cost in this process. The more teeth that are missing or damaged and implants that are needed, the higher the overall cost. In addition, despite the many health benefits that dental implants offer, insurance does not typically offer coverage for financial assistance. This means you, the patient, will face a higher out of pocket cost. A dental implant can be expensive when there are additional health issues that have to be addressed. The dental implant procedure should be fairly straightforward if you have good overall dental health and your bone, existing teeth, and gums are healthy. This means your out of pocket cost will be on the lower end (roughly between $1,500 and $6,000). However, if you have additional issues such as tooth decay or bone density issues you may need additional procedures such as an extraction or a bone graft. These will increase the total cost. The types of materials used can also adjust the price point of your implant. 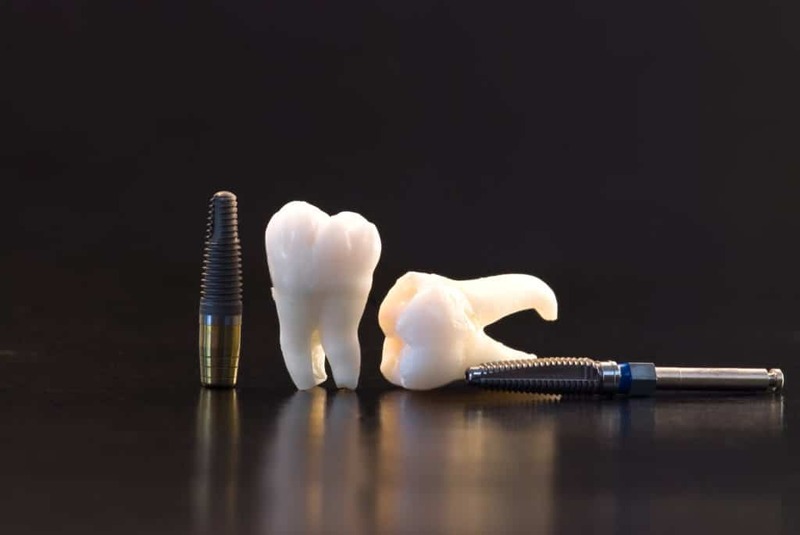 The base of an implant can be made of various metals such as titanium while crowns can be made of porcelain, stainless steel, resin and/or ceramic materials. The more expensive the materials used, the higher the cost will be. Talk to your dentist in detail about the varying types of materials and the pros and cons of each. While cost is important you should also consider longevity and durability. Your location may also be a factor in the average cost of a dental implant. In areas where the cost of living is higher you may find that dentists charge more due to higher rent and overall expenses that they have to cover (https://www.spiritdental.com/blog/individuals/the-cost-of-dental-implants-broken-down&highlight=WyJicmlkZ2UiXQ==). Your dental professional’s level of experience is another factor in implant cost. A seasoned dentist that has 30 years of experience and the accompanying continuing education may charge more for their time and skill than a dentist that has just obtained his or her licensing and education. When dental implants are done correctly and well maintained they can last your entire lifetime. So you will end up saving money in the long run. In addition, a missing tooth may make you feel self-conscious or less open to smiling. You should be able to project your best self and be proud of your smile. Dental implants are not cheap but they are a highly effective substitute for a missing tooth. If you don’t have the smile you have always wanted, call our office. We can find the best solution for you and your budget.